This new Texan NEEDS a BBQ set. In fact, when we moved to Texas we left our old grill in California… but we now need these awesome tools to accompany our new Texas-sized grill. PLUS, it’s so hot here we grill all the time to avoid heating up the kitchen. You name it, we grill it! Fingers crossed! I think my favorite thing to grill is corn on the cob. When feeling decadent, I will sprinkle with salt and chili powder, wrap a slice of bacon around it and then cover in foil. wrap BACON around the corn? that is a new tip I’ve never heard – love it! I like to grill vegetables like squash and zucchini. So healthy and so tasty! My boyfriend is a great cook and enjoys to BBQ. We spend a great deal of time outside by our fire pit as he BBQs for us. I would love to win a set of new gadgets for the grill. Thanks for the give away! I also have liked Mr. Bar-B-Q on facebook. My grandpa used to make the best steaks on the grill. Just had grilled pizza for the first time and it was delicious! Juicy tips, huh? I LOVE spiedie anything. I grew up in Upstate NY and these are standard fare when grilling. You cannot go wrong with this marinade. I also liked Mr. Bar-B-Q on Facebook! MMMM, I am absolutely loveing grilled pizza this summer. I’ve been making it 2-3 times per week, and am not sick of it yet! I love grilling vegetables such as bell peppers, squash, and zucchini. It adds such a nice flavor! We just made mediterranean chicken kebabs with a cool cucumber sauce and it was divine! Tender, flavorful, balanced, and delicious! I love a good ‘ol, huge burger from the grill! I do my best to mix up the meat and seasonings and the hubs grills them to perfection. Great teamwork if you ask me! I love to grill fish tacos. Yum! Love this give-a-way! We’re BBQ-ing every weekend lately and covering everything (chicken, burgers, dogs) with a hot bbq sauce. Then I take my dog, bun it and put some sweet mustard on it. The combo of the hot/smoky bbq sauce and the sweet honey mustard is amazing. I like lemon or lime marinated chicken on the grill. I’ve been eager to try grilled pizza, but don’t have the right tools and haven’t done it yet. I love BBQ’d chicken! I just tried a Rachel Ray recipe, Honey Mustard BBQ Sauce, and it was delicious! Made some for my dad too! My #1 grilling tip is to always let the grill get HOT before you put your meat on! …and always lightly oil the grates. Corn on the cobb. Best when grilled in the husk on the BBQ. So juicy and delicious. My favorite tip is to watch out so you don’t burn your bangs. We had a little flare up last summer and my bangs burned. Oops. I’ve been wanting to try pizza on the grill too, but I haven’t gotten around to it yet. My favorite chicken marinade is so easy to make. 1/2 cup lemon juice, 2 tablespoons each olive oil and dried rosemary. Throw it all in a ziploc with about 4 chicken breasts, plus some lemon slices if you have a fresh one on hand, and marinate in the fridge overnight, or at least 8 hours. Sadly I don’t have any juicy grilling tips because I’ve never actually grilled! My husband is pretty good though and these tools would be much loved by him! Favorite is kabobs. The best is lemon chicken. The marinade is so easy… Italian dressing, lemon juice. So yummy! i love to grill chipotle chicken thighs…grilled corn…homemade salsa…instant tacos. i am intrigued by the pizza stone but would love either. thanks for the opportunity. …and i “liked” mr bbq. I love to grill fruit! All fruit! Trying to grill pizza but. Have not mastered this yet. One of my favorite memories of grilling comes from my childhood. Dad always did (and still does) the grilling in that house; however, Mom tried to cook something (burgers maybe? …it’s been a while) for dinner as Dad was working late that evening. Let’s just say that even the dogs wouldn’t get near it when she finished with it! One of my all-time favs for the grill is pineapple. So simple, yet so addictive! Grilled chicken with white BBQ sauce. I looooove the Greek Kabobs my mom makes. Marinate pre-chopped bell peppers, onions, grape tomatoes, and mushrooms, as well as chicken pieces, separate from the veggies, in Greek dressing (I like to make my own) over night. Start the veggies 5 minutes before the chicken, or 20 minutes if you use a grilling basket. DELICIOUS, and it makes for great leftovers! The best bar-b-que is shoyu chicken & teriyaki beef. In Hawaii you can grill pretty much year round & we spent many a Thanksgiving Day bar-b-quing shoyu chicken on the beach. Soak chicken thighs in a mixture of Aloha soy sauce, peeled fresh ginger slices, garlic cloves and a little sesame oil. Eat em while it’s hot and fresh off the grill! Serve with hot rice. So ono! I love grilled food. And like you, my favorite part about it is that my husband does the cooking. And it’s delicious. I love making grilled pizzas! My favorite grill item is a kabob. It’s somewhat unique where we live and always easy to throw together! I buy large chunked stew meat and an assortment of vegies. Everyone can build their faves. Serve with a variety of sauces, dips, and dressings for dipping fun. For dessert- fruit and cake kabobs drizzled with chocolate and caramel. Would LOVE the BBQ Pizza kit! My favorite recipe is grilled green beans. I marinate them first in soy sauce, sesame oil, garlic, and ginger. Grilled pizza…marinated chicken, artichokes, prosciutto, basil pesto, and lots of fresh mozzarella…YUM. My bro just made bacon-wrapped green bean bundles – par-cook (steam or boil) the beans, then wrap 6-8 beans in one strip of uncooked bacon (wrap tightly) and grill. Delish. I’m a grilling novice, but would like to go pro. Favorite thing to grill – pizza. Never used a stone, would love to try. Most interesting thing we’ve grilled – hot dog shaped hamburgers. Yes, you read that right. Hamburgers shaped into hot dogs. The concoction came about once when we had a surplus of hot dog buns and no hot dogs. Once you got past the weird shape, they were great and tasted just like regular hamburger. i have dreams about my future bbq with gas/smoker/charcoal options because i NEED all of them. but for now i am happy with my charcoal bbq’d tri-tip! My dad is the best barbequer I know. Everything comes off juicy as can be and never burnt. Everything that comes off of my grill is dry and charred. Why is that? Maybe some new tools will get me some more skills;) Plus I have been DYING for a pizza stone. I love homemade pizza. Mr. Bar B-Q and I are friends on facebook now. Favorite thing to grill- as much as I love grilled vegies… nothing beats a still pink steak! We love to do sliced flank steak at our house- not only is it cheaper- when sliced right, it always comes our nice and tender! I love chicken and corn on the cob on the grill. I think the corn cooks so much better and the chicken has so much better flavor then the oven chicken I normally make. My boyfriend loves to grill — I just have to hand him some raw meat/fish/veggies/whatever and off he goes. It’s nice not having to be the one to cook all the time! Mmm, BBQ here is a whole different tube of wasabi, thank goodness my husband prefers to cook American style. He’d love something like this. Our favorite thing to eat is chicken that’s been marinated in my grandfather’s BBQ sauce. The secret is the whole head of garlic in it. I make a huge batch , and freeze a couple of bags of breasts. The marinate as they freeze, and as they thaw. Mmmm, I think we’ll have BBQ this weekend. Lately it is grilled zucchini, as the garden is cranking it out faster than we can eat it. I’m convinced that buying a grill saved my marriage. Before we had it, my husband was not interested in helping make meals. Now he can’t wait to go out and play with fire. ha! He would love these tools! Years ago, when my husband and I were first dating, we bought a little grill fueled by a propane tank! I am amazed at the things we were able to cook on that thing! I love grilled corn on the cob and grilled pineapple. They’re delicious! It’d be so fun to try making a Hawaiian pizza on our grill with this fun giveaway! My favorite thing to grill is a big bunch of chopped veggies (peppers, mushrooms, onions, squash) on skewers then toss them in a bowl with italian dressing, yum! I love grilled food but don’t have a grill. 🙂 I was at a friend’s last night and they grilled burgers and they were delicious. My attempts at making pizza on the grill have *not* turned out well, so any help is welcome! I really want to learn how to make a great grilled pizza! We love just about everything on the grill, but especially love hamburgers, pork chops, zucchini and asparagus. Kebabs are also a huge hit around here. Thanks for the chance to win! Want those tools…oh yes I do. Want a delicious recipe for potatoes on the grill?? Delicious, but not necessarily calorie friendly. Somewhat thinly slice about 5-8 potatoes and put them on a Pam sprayed piece of heavy duty foil (foil large enough to make a cooking packet). Slice or dice a small onion and throw on the potatoes. Sprinkle liberally with salt and pepper. Pull the sides up a bit on the foil and pour about a half cup of broth of some sort (I use vegetable broth)over the potatoes and onions. Sprinkle with Worcestershire Sauce. Spread grated cheddar cheese over the top (to taste, but we usually use about 2/3 cup), dot with three or four tablespoons of butter then seal up the foil packet and cook on the grill for about 20 minutes. Move to low or indirect heat and cook for another 10 – 15 minutes. Yummy, yummy potatoes. Everyone summer my Dad has to relearn how to BBQ so the first few burgers are always a little on the charred side! We love it anyway! My tip would be to assign one person the “man” the grill. I tend to overcook anything I grill since I’m usually running up and down the deck stairs from the grill to the kitchen trying to finish other prep. I like Mr. Bar B Q on FB! We joined a CSA this year so we have been grilling a ton of veggies. We seem to rarely cook inside in the summer! I’d love to try grilling pizza! My husband and I are still grilling newbies, but we really like marinating tofu in a soy vinaigrette and grilling it on skewers. Simple but really yummy. I love grilling. I attempted pizza but I need some work. The pizza stone would be handy. My favorite is grilled pineapple. I sprinkle it with cinnamon and sugar–it’s the only way my 7-year old will eat pineapple! I love to grill chicken thighs. The meat on the thigh is more tender than a chicken breast and oh so delicious on the grill! It is so good, only the flatbread takes a while to rise. Isn’t everything good onthe grill? I honestly can’t pick my favoite thing to grill there’s just way to many:) I’ve been wanting a pizza stone for the gill forever!!! My dad does the grilling but I’m going to make him teach me…I might go a little grill crazy, just a little…. I’ve never made pizza on the grill but would love to try. I like corn on the cob topped with salted butter and grilled asparagus wrapped in bacon or parma ham. We also do jerk marinaded chicken with grilled pineapple salsa as well as peach kebabs with honey and mascarpone. Yummy! Thank you for offering a giveaway! I am a full-time employee in Corporate America and a mom of four who runs a food planning website/blog in my “free” time (www.DiningDivaDinners.com) The best way to minimize my cooking time is to plan to grill because my husband won’t let anyone else touch his grill! 🙂 We wore out our grill earlier this year (and had to replace it) with all the grilling experiments, so new tools to go with the new grill would be a blessing. Our current favorite to grill: pork chops with this rub. It keeps the meat super JUICY! Mix all ingredients together. Rub on meat of choice 8-24 hours before you plan to eat. Nothing better than a steak cooked on the grill! Although I would like to try that pizza kit! How to pick just one grilling recipe….I have so, so many. We live in Seattle and are lucky enough to have a large covered deck so we use our grill year round at least 3 to 4 nights a week. My newest fav is to use a grilling basket and grill up some fresh vegetables. Just cut the vegetables in to large bite size pieces Tossed in a little olive oil, fresh lemon juice, lemon pepper, lemon zest and sprinkled with a little kosher salt and red pepper flakes then grill for 10 or so minutes. I use zucchini, squash, peppers, onions, grape tomatos, carrots, broccoli, snap peas or green beans…the possibilities are endless. Honestly, we grill it all, and very infrequently use a recipe. I don’t want to turn on the oven here! It’s just too hot. One of our favorite recipes was grilled eggplant slices sandwiched around soft cheese and herbs. Wrap a half a slice of good bacon around 3 or 4 spears (depending on the thickness) and grill for 7ish minutes. I use a sheet of foil under the asparagus to keep if from burning. This recipe calls for using the oven for the majority of the cooking time, but the grilling is what makes them perfect. Rub both sides of the ribs (I use baby backs)with a dry rub of equal parts garlic salt or powder, chili powder, paprika, cayanne. I add just a little sugar to the rub. Bake at 350 for 2 plus hours. Remove from oven, brush on a good barbacue sauce and grill for about 5 minutes. The oven allows them to get nice moist and the grilling adds just enough crispness. Mmm, they are so good. I think it’s hard to beat simple eats like steak, shrimp, and all kinds of veggies on the grill. Love it when there’s a char on the outside and a tender center! My favorite thing to grill is peaches! Normally I hate ‘healthy desserts’ (I mean, it’s dessert, it’s not supposed to be healthy!) I cut the peaches in half, remove the pit, grill for a couple of minutes on each side, and then top with honey. It’s sooo good–almost like eating the filling out of a peach pie. Even better topped with vanilla ice cream! Grilled pineapple is divine! So easy and so good. 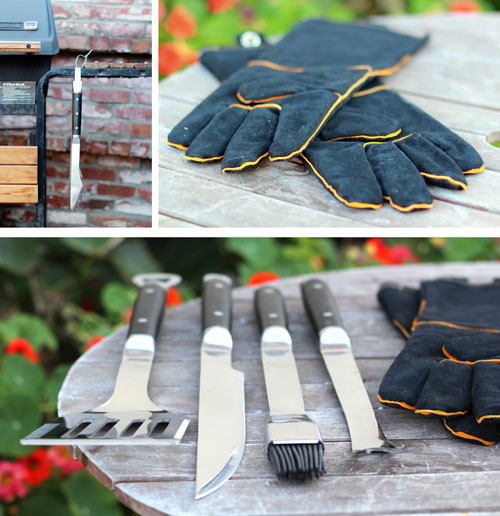 Grilling pizza is on my list of things I want to try, so this set would help so much. ZMy favorite bbq memory as a child was having all the friends and family get together in our backyard to relax, catch up and share great grilled food and everyone’s homemade dishes. One of my new favorite appetizers to make on the grill is Cauliflower…even better, its super simple and super tasty. Cut up the cauliflower into medium size pieces. Put the cauliflower and oil/parm mixture into a bag, seal and shake. Throw on a grill pan (not needed if you have small slats on your grates) and grill for 5-10 min until crispy. Be careful though – the crisping part happens fast and its easy to burn if you’re not watching. Pull off the grill and serve with ranch dressing for dipping. Dying to grill a pizza and want to use a whole wheat white flour mixed with barley flour recipe I recently read. And kebobs! Believe it or not carrots are excellent on the grill! I’ve been grilling olive oil -rubbed asparagus this summer;yum! comment comment comment, this is my clever comment. I liked Mr. BBQ on fb. I also love cinnamon covered fresh pineapple on the grill! So delish! My favorite thing to grill is chicken breasts, but that’s just because of a confidence thing– I need a bit more practice with everything else. We’re trying all kinds of things, just to keep the heat outside and not in the kitchen this summer. My family loves to grill up a bunch of different types of meats and veggies and then make individual grilled pizzas with them. Super yummy and everyone gets to choose what they love best. I love to make chicken fajitas on the grill with some homemade tortillas. Yummy! addicted to grilling marinated, spatchcocked chicken. Lately I have been into beer can chicken!! My neighbor thanked me the other day for scenting the air with the smell of barbeque!! How the aromas disperse and float! Marintated chicken for 24 hours in Good Season salad dressing and the aroma that filled the air was mouth watering! I love slicing pineapple and covering it with a honey and lime zest mixture and throwing it on the grill. The honey caramelizes and the pineapple is so juicy. Italian dressing on the meat the night before. It’s simple and cheap, but it always makes for the most juicy and succulent meat. I’m new to BBQing so I don’t have too many tips, but one thing I’ve found that is very effective is to use a oil soaked paper towel to grease the grates with after they’re hot, but before I start grilling. No sticking yet! I love nothing more than grilling a juicy rib-eye on the grill. The only thing it needs it a little salt, pepper, & a flame touch to medium perfection. Living in Texas, there is nothing that the neighbors love more as well! I love salmon on the grill- just a little seasoned salt and lemon juice and its delish. I’ve also been craving grilled zucchini.. I think that will be on the menu tonight.. I too liked the FB page! Would love some new grilling tools! My mother gave us a pizza stone for the holidays but never sent it out .. so now she’s returning it and we still haven’t tried grilled pizza yet! Recently we’ve been making grilled fajitas and they are so great – with a vegetable rack the onions and peppers are nicely cooked to perfection. One of my favorite things to BBQ lately, is Chicken Veggie Kabobs, marinate the chicken first in a plain yogurt, lemon juice, s&p, cilantro, chopped green onions for 30 minutes or overnight. Soooo seriously good! Yum! Thread the chicken chunks alternating with cherry tomatoes and chunks of green squash, sprinkle with more s&p. I like to make scalloped potatoes on the grill. I make a foil packet (triple layer the bottom) and smear butter on the foil. You can also use PAM. Then peel about 3 lbs of potatoes and slice very thin. Dot the potatoes with butter. Salt and pepper to taste. Then I add a layer of either Velveeta cheese or American cheese (whatever you have on hand), then I spread a layer of Cream of Mushroom soup over the cheese. Add a layer of foil to the top and crimp the edges of the top layer to the bottom layer. We usually put these on about 15 minutes before the meat and continue cooking while the meat cooks. If you need room you can move it to the top shelf, which is wear the pizza server would come in real handy! 🙂 Anyway, they are almost failproof and keeps the heat out of the kitchen and is easy for cleanup. Good luck to everyone on the grilling giveaway. One of my favorite things about summer are the many cook outs we’re invited to! I love the chill atmosphere of hanging out with friends in the backyard, sipping on sweet tea, playing corn hole, and smelling the delicious food cooking on the grill. Grilled pizza would be a first for me, but it sounds SO good (any pizza is a-ok in my book)! This summer we discovered how awesome brined pork loin can be on the grill. Add a little brown sugar/honey/chili powder glaze and YUM-A-LICIOUS. I love to grill zucchini by brushing on olive oil and sprinkling on sea salt. Hoping to win the giveaway for my brother who loves to grill and is turning 40 soon! My favorite recent grilling recipe is from Food Network Magazine. You coat some sliced squash and onions in olive oil, sprinkle with sea salt and fresh pepper. Cook these in a grill pan and then squeeze in the juice of a lemon and top with parmesan cheese savings. Yum! I’d love to have the pizza tools! Grilled pizza is my new favorite! My favorite grilling memory is my engagement seafood cookout to celebrate my 4th of July proposal last year to my now-wife Angela! My favorite is grilled shrimp! One of my favorites is to grill baked potatoes with onions and parm cheese! Cut about 3 slits in potato (depending on size) fill the slits with parmesan cheese and slice vidalia onion. Wrap up in tin foil and grill away! So easy and SO delicious! There is nothing as good as well prepared steak on the grill. Hubby surprised me with a ribeye rubbed with truffle salt. Simple. Juicy. Delicious. Hello! My favorite grilled item is very simple. I love grilled corn. I had never had it on the BBQ until my husband fixed it for me. We love to BBQ. It’s such a special time for us and I love watching my husband and my junior grillers (4) outside while I’m seasoning and fixing sides. It’s also a plus that I don’t have to clean up much or cook that day. Yay for grilling!!! Kabobs on the grill are the favorite in this household! The best tip I can give is to always have a cup of water or a beer handy near the grill. You never know when you’re going to have a flare-up….mostly bc the hubs isn’t paying attention. I’ve witnessed our grill on fire way too many times beacuse the game was on. We just got our first house and our grill that we have had for a long time is finally up and ready for some love! Now all we need are some tools to use with it! This would be perfect! Grilled apricots! Cut ’em in half, grill the cut sides, and turn often so they carmelize evenly. Turn the halves over and melt some bleu cheese in the pit hole. Take them off, and drizzle with honey.